Updated June 1, 2016 at 2:25 p.m. with a quote from Ryan Mercer. Republican gubernatorial candidate Bruce Lisman, taken to task earlier this month for a campaign flier that targets rival Phil Scott, has ramped up his attack with a second flier just a week later. Both of the mailings seek to link Scott, the three-term lieutenant governor, with departing Democratic Gov. Peter Shumlin. Scott and Lisman are competing in the August primary for the Republican nomination for governor. The new flier includes a photo of Scott and Shumlin laughing together overlooking what appears to be Lake Champlain. “A Picture is Worth a Thousand Words. Phil Scott Won’t Change Vermont’s Direction,” it declares. 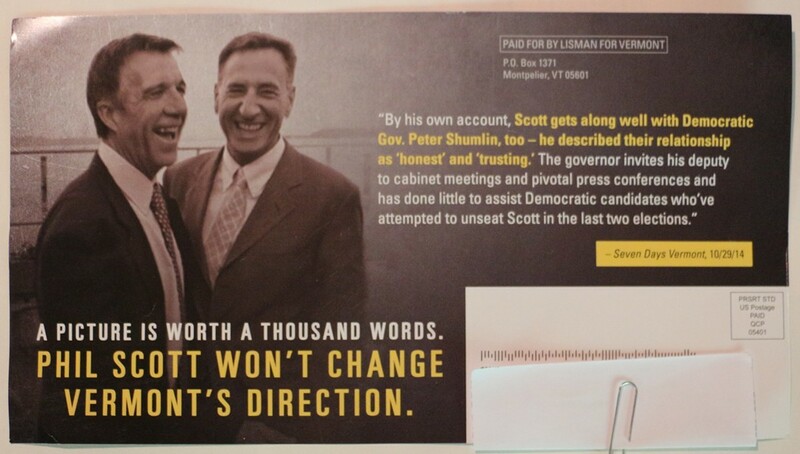 In the earlier flier, Lisman’s campaign used a Vermont Public Radio photograph of Scott and Shumlin without the station’s permission. The photo of Shumlin and Scott in the newer flier was taken in 2011 by freelance photographer Joshua Lambert for the Burlington Free Press. Lambert posted it on his blog. The full image shows that Scott and Shumlin were laughing along with Lake Champlain Chamber of Commerce president Tom Torti, who was cropped out of the image on Lisman’s flier. Lambert said he doesn't know if he or the Free Press owns the rights to the photo, but said: "I don't want my stuff being used in a political campaign." Free Press photo editor Ryan Mercer said the paper and Lambert have dual rights to the photo. But because it appears Lisman’s campaign took the photo from Lambert’s website, the paper won’t pursue the issue. “If it was from our site, I’d be talking to a lawyer right now,” he said. "I think it's wrong." By his own account, Scott gets along well with Democratic Gov. Peter Shumlin, too — he described their relationship as ‘honest’ and ‘trusting.’ The governor invites his deputy to cabinet meetings and pivotal press conferences and has done little to assist the Democratic candidates who’ve attempted to unseat Scott in the last two elections. Scott has expressed doubts about the state’s rollout of the Vermont Health Connect insurance exchange and in recent months has called for moving instead to the federal exchange or a multistate alternative. Some Republicans have long criticized him for not being a more outspoken critic. Lisman’s latest missive launched a sharp Facebook exchange with each of the candidates’ campaign managers entering the fray. H. Brooke Paige of the Orange County town of Washington, a perennial candidate who is running as a Democratic candidate for both governor and attorney general, lit into Lisman on Facebook early Monday. “Lisman’s reality at odds with the facts!” Paige charged. Paige pointed out that Shumlin endorsed Scott’s 2014 opponent, Dean Corren. “There are numerous articles from the 2014 election news cycle that confirm the icy post-endorsement relationship between Shumlin and Scott,” Paige wrote. Disclosure: Terri Hallenbeck formerly worked at the Burlington Free Press.